To be honest: I haven't watched a ton of baseball. I've watched enough to know that Yu Darvish is a freak and that you don't want to mess with Clayton Kershaw (or the Dodgers in general since the break). I've seen pitching fall apart for the Giants and Nationals (sorry, Nats fans), and especially, the Giants' World Series order get real, old real fast. I have seen the mighty Red Sox bats, Miguel Cabrera turn nothing into a home run, and Mariano on his farewell tour. But I haven't watched a whole lot of complete games as weeknights and weekends have been consumed by a new house. Good thing that with baseball, I strongly believe stats tell a big part of the story. You could say I bought Moneyball hook, line, and sinker. All of these stats were downloaded from Baseball-Reference's excellent site, using their projections for WAR. First, Total WAR (far right), which combines the average WAR for the teams' top 3 pitchers (by innings) with that of the batting lineup (top 9 by plate appearances in the AL and 8 in the NL). WAR rates the White Sox and Nats as the best teams. However, the Nats had telegraphed their plan to bench Strasburg (again, sorry Nats fans), so I also included a No-Stras line for Washington. In the picking competition, I ended with the Yankees, White Sox, Rays, Nats, Cards, and Dodgers. Yankees and White Sox were no-brainers to me in the AL, where I picked first. I took the Nats thinking I needed a team that I knew would at least make the playoffs. And the Cards had that tantalizing run differential. I still think my NL projections were more or less correct. You could argue that the Nats were a few strikes away even without Strasburg, and the Giants were by no means the behemoth they turned out to be in October. Run differential and WAR also liked the Cardinals and Reds, which turned out to be accurate. But what happened to the Yankees and White Sox in the AL? First, pitching. The White Sox dominated most pitching stats I tracked and were especially good at avoiding walks, resulting in a league-leading WAR for their top 3 starters, and it wasn't close. 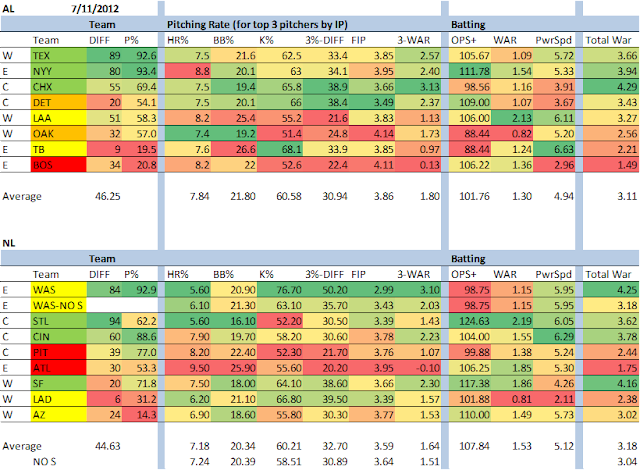 But wait: look at the column just to the left of WAR: Fielding Independent Pitching, or FIP. This measures a pitcher's performance if his defense made plays on various balls at the league-average rate. This is pretty advanced, tracking where each ball is hit and assigning a league-average run value. Think of it as the batting average directly attributable to the pitcher. The Tigers led the league in FIP and the White Sox starters look like they may have benefited from some fielding luck. Overall, the Tigers' were a bit better at throwing strikeouts, which I believe is more indicative of future performance: not walking guys is good, but if you're constantly throwing over the plate, eventually it can catch up to you. Next, batting. The White Sox are merely average here, but I believe pitching to be more important due to the heightened impact of defense in the postseason (i.e. pitchers have an outsized influence on a series due to batters only accumulating so many plate appearances). Good pitching and average hitting should be a decent combination. But look at OPS+ (On-base + Slugging, adjusted for the team's home park). Again, the Tigers lead, just behind the Yankees (who also got old fast). And the White Sox? Solidly orange, below average. I know there are other numbers that go in to WAR, like proprietary B-R defensive stats, but I wonder if I'm on something here. Take the same stats to the NL. FIP likes the Stars-less Nats, the Cards, and Dodgers, who weren't likely to make the playoffs. The Giants are average, but not terrible. But OPS+ hates the Nats as the worst hitting team in the league, which you wouldn't have guessed from WAR, while the Cards, Giants, and Braves really stand out. This makes the Nats seem downright mediocre as opposed to slightly above average. The real interesting part is combining FIP and WAR. 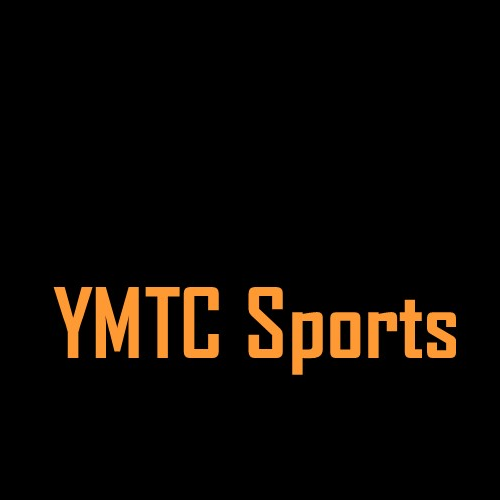 If you take the league leaders in both categories, you have the Tigers, Yankees, and Cardinals, all teams that made the Championship Series. Or look at teams that are green in one stat and no worse then yellow in the other: Tigers, Cardinals, and Giants. Importantly, you avoid the White Sox and Nationals whose bats were worse than they seemed. Now, a word of caution: sample size and process. You want to think your decision-making process is solid rather than just judging by results. For example, going for it in the red zone rather than kicking field goals may not work every time. But the stats indicate that if you do so, your expected point total goes up more on average. If you believe those stats are well-vetted and your thought process is consistent, you should still go for it. There is inherent danger in my looking at what happened last year and making non process-based, hindsight judgments. I do think these tweaks have merit because I believe defensive performance is hard to judge, and even the primary baseball statistics site s(Baseball Prospectus, Baseball-Reference, Fangraphs) each have proprietary WAR formulas that while are logically proven, can often result in wide variances. Also, I don't know that defense (other than pitch framing) shows up consistently in a series due partially to sample size. Speaking of which, this is only one season's data. Making a decision based on these numbers is dangerous, but that's the fun: seeing if my hypothesis holds up over multiple sample sets. This year, FIP and OPS+ love the Red Sox, Tigers, Rays, Indians, Cardinals, and Dodgers. xFIP, which regresses FIP for league-average home run rates on fly balls, also likes the Reds, making it seem like their pitchers have suffered from bad home run luck (or the homer-friendly Great American Ballpark). 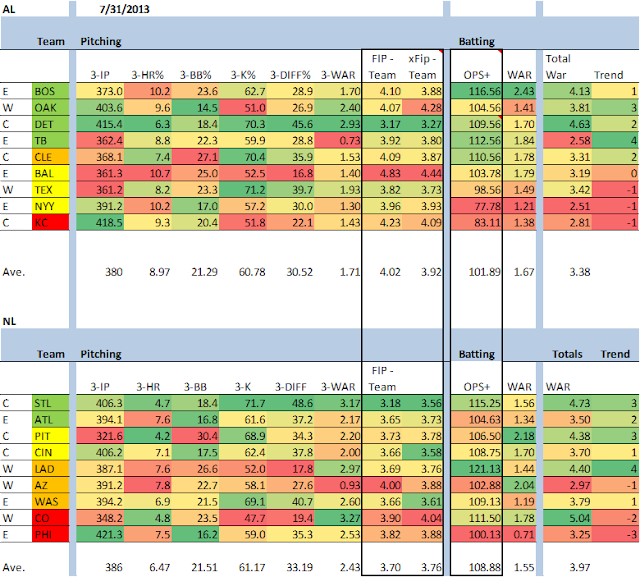 I also used team-wide FIP stats, wanting to capture some of the other pitchers. The stats seriously love the Tigers, who I believe to be the best team in league, and maybe in either league. This is borne out by their run differential (+161 as of today), just behind Boston's (+162). Boston are hitting really well, and the playoffs should somewhat test the offense/defense hypothesis. In the NL, the stats and I continue to love the Cardinals, and I think the Dodgers are coming on with a healthier team and good contributions from young guys. Looking at both leagues, I think it's interesting that the average OPS+ favors the NL (which is weird considering the DH effect in the AL). But also, the NL teams also have markedly lower FIPs, which is really weird. Even looking at WAR, the NL looks dominant. Something to keep in mind when the Series rolls around. In my contest with BPix, I took the Tigers with the first overall pick, and ended up with them, the A's, Rays, and Orioles. In the NL, I took the Dodgers after he grabbed the Braves, and ended up with L.A., Saint Louis, Arizona, and Washington. I feel really good about the Tigers, the A's are starting to make a comeback, and I can only hope the Cardinals get win the division as I think they'll win it all. I think they're the best team in the NL (outsized hitting stats with runners in scoring position aside). And given the NL playoff teams' overall advantage, I think that it will be an NL team again this year.